A beautiful quote from Queen of the Sun: What Are the Bees Telling Us? 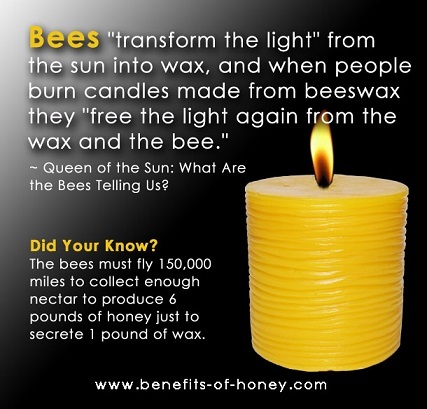 : Bees "transform the light" from the sun into wax, and when people burn candles made from beeswax they "free the light again from the wax and the bee." However, last week someone remarked that it was the dumbest thing he had ever heard when I posted the quote in Facebook. This draws parallel to how some people tend to react to what little they know about honey and insist that we are silly to think that honey is anything more than sugar. When it comes to the warmth and health of the hive, there is more to than meets the eye. Full account of why beeswax candles are so special in: Beeswax Candles Versus Paraffin Candles. Corn syrup is fine in moderation ?